Free parking for visitors to the Arizona Capitol Museum, House/Senate proceedings, the 9-11 Memorial and Wesley Bolin Memorial Plaza is available in the Wesley Bolin Plaza parking lot. That's located just east of the Capitol building, with one south entrance off Jefferson between 16th and 17th Avenue (Jefferson is a one-way street in this area, going east) and another parking lot entrance on the north on Adams (Adams is a one-way street going west). From I-17 take Exit 197, State Capitol/19th Avenue. Drive north to Jefferson, then east across the 17th avenue entrance to the Wesley Bolin Plaza parking lot. From I-10 (Papago Freeway) take Exit 143C, turn south on 19th Avenue. Drive to Jefferson and turn east across 17th Avenue to the Wesley Bolin Plaza parking lot. If you are coming from the Downtown Phoenix entertainment district or Convention Center area, you can drive west on Washington. Look for the entrance to the north visitor parking area before you get to 17th Avenue. METRO Light Rail does not have a station near the Arizona State Capitol. 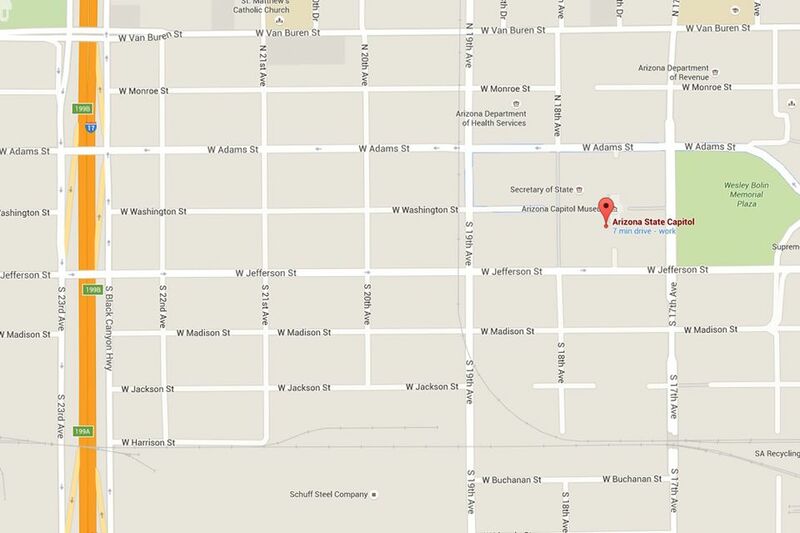 The nearest station is about a mile away at 1st Avenue and Jefferson. You can use the Valley Metro Trip Planner to find the best connections if you are using public transportation. You can see this location marked on a Google map. From there you can zoom in and out, get driving directions if you need more specifics than mentioned above, and see what else is nearby. ​See driving times and distances from various Greater Phoenix cities and towns to Phoenix. 9-11 Memorials in Greater Phoenix. We'll Never Forget.